Updated July 12, 2015 – The Civil War-era facades of the old whiskey warehouses along Main Street are still standing for now, but whether they will be able to survive the aftermath of Monday’s (July 6) four-alarm fire that caused extensive damage to the structures is still very much in doubt. Louisville firefighters are now blaming sparks from either a cutting torch or grinder for the fire in the warehouses next to Brown-Forman’s planned Old Forester Distillery and visitors center. Construction workers had left the site shortly before the fire was reported, according to various media reports. Investigators believe sparks used by one of the tools reached combustible material in the building’s basement and smoldered for some time before bursting into flame. 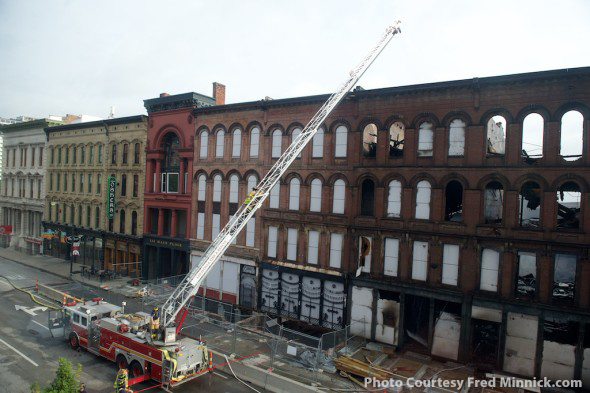 The three buildings essentially destroyed in the fire were owned by Main Street Revitalization, an investor group that included Brown-Forman along with individual members of the Brown family. The group acquired the buildings along Main Street at First Avenue in 2011 to keep them from being demolished, and was starting work to redevelop them into the “111 Whiskey Row” project with a combination of retail, office, and apartment space. The adjacent buildings owned by Brown-Forman received relatively minor damage, and company executives are waiting for structural engineers to review the site before moving forward with construction later this summer on the $45 million project. WDRB-TV in Louisville obtained this copy of an email sent to Brown-Forman employees by the company’s executives Tuesday. As many of you may know, three buildings along Louisville’s Whiskey Row on West Main Street were heavily damaged by fire Monday afternoon. The fire started in the building adjacent to the buildings where we will build the Old Forester Distillery and Visitor Experience and spread in the opposite direction (toward the east) away from our buildings. Thankfully, no one was injured in the fire. As far as we know this morning, our Old Forester Distillery buildings suffered little damage. However, we will need to get structural engineers to inspect them before we can be assured of their exact condition. At this point, however, our plans remain unchanged and we will continue with preliminary work and hold a ground-breaking ceremony later this summer and begin construction on the project. The timing of that event could change based on the condition of both our buildings and the three other buildings involved in the fire, but as of now we do not know of any reasons to change our plans to develop the Old Forester Distillery on Whiskey Row. Unfortunately, the fate of those three buildings engulfed in the fire is much worse, as all experienced very heavy damage. The hope is that the three facades of the buildings can be saved, preserving the look and feel of Louisville’s nineteenth century Whiskey Row. Brown-Forman is one of the investors in Main Street Revitalization, the organization that was created and funded by several community leaders as well as our company several years ago to purchase and save the Whiskey Row buildings from demolition. The preservation of our historic structures in our community and elsewhere is vitally important to us, as they reflect the unique character and history of a place. So Brown-Forman and Main Street Revitalization join with preservationists everywhere in lamenting the serious damage done to the three historic buildings on Louisville’s Whiskey Row. We are grateful, however, that the two Old Forester Distillery buildings were spared from the ravages of the fire, thanks to providence and the work Main Street Revitalization did to stabilize the structures prior to our purchase of the buildings last month. All of us at Brown-Forman and Main Street Revitalization commend the excellent work of the Louisville Fire Department for keeping the fire from spreading west to our Old Forester Distillery buildings and preventing the blaze from damaging other occupied buildings nearby. We will update you further about the condition of the Old Forester Distillery and other Whiskey Row buildings when we know more. Louisville fire officials hope to allow structural engineers into the buildings this week to examine the damage, but have blocked access so far because of the potential for the remaining walls and facades to collapse in strong winds or rain. A spokesman for the 111 Whiskey Row project told the Louisville Courier-Journal that decisions will not be made on when or whether the development can proceed until after the engineering review is completed. This story will be updated with additional information as needed. Editor’s note: This story was updated with new details on the cause of the fire.